The following review was conducted in October 2017. The following review was conducted in August 2017. The Obihai OBi1062 is a color SIP phone that comes with Bluetooth and WiFi (802.11n) compatibility. The phone has Power over Ethernet (PoE), two Gigabit Ethernet ports, and two USB ports. 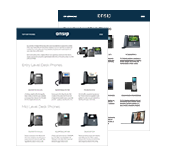 It also offers HD calls through voice codecs such as G.722, Opus, G.711, G.729, G.726, and iLBC. The Obihai OBi1062 seems like a phone that could potentially challenge old time stalwarts like Polycom and Grandstream. But did the phone live up to these expectations? We subjected the OBi1062 to a comprehensive review to find out. The following review was conducted in April 2017. The HTek UC924 is a color enterprise IP phone that can register up to four SIP accounts, along with eight line keys and five-way voice conferencing. The target users for this phone are corporate staff, administrative assistants, and employees working with bandwidth-intensive application on collocated PCs.